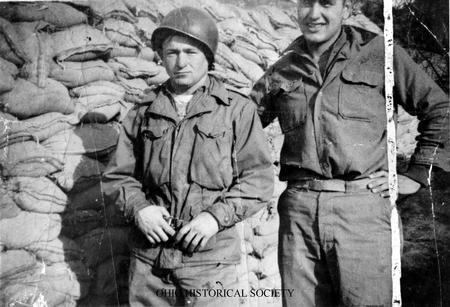 Reproduction of a photograph of Ron Rosser, recipient of the Congressional Medal of Honor with fellow soldier in Korea, ca. 1952-1953. Rosser was a corporal with the Heavy Mortar Unit, 38th Infantry Regiment, 2nd Infantry Division, United States Army. During service in the Korean War he received the Congressional Medal of Honor for his single handed attack on enemy bunkers. The Korean War was one of several military conflicts that occurred during the Cold War, as the United States and its allies attempted to stop the spread of communism. This conflict began on June 25, 1950, when North Korea, a communist nation, invaded South Korea. Prior to World War II's conclusion, North and South Korea had been a single country known as Korea. After the war, Korea became two countries. By invading South Korea, North Korea hoped to reunite the two nations as a single country under communism. With North Korea's invasion of South Korea, the United States feared the spread of communism. Determined to stop North Korea, the United States sought permission from the United Nations to support the South Korean government military. The United Nations granted permission to the United States to send troops to the two Koreas to free South Korea from North Korea's military occupation. Although many of the soldiers sent to South Korea were members of the United States military, they were under the direct control of the United Nations. Because of this and because the United States never formally declared war on North Korea, many people contend that the Korean War should be called the Korean Conflict rather than referred to as a war. Technically, these people are right from the American perspective, yet North and South Korea were clearly engaged in a war. The American troops, as well as those from other countries, were hoping to protect South Korea from communism and thus were participating in the Koreans' war. With the arrival of United Nations forces in South Korea with the Inchon Invasion, the tide of the war quickly turned against the North Koreans. The United Nations forces and the South Koreans quickly drove the North Koreans back into North Korea. The South Koreans and United Nations forces did not simply stop with the North Koreans' withdrawal from South Korea. These forces continued to attack the North Korean military, hoping to free North Korea from communist control. By October 1950, the United Nations troops had driven North Korean forces to the border of China. Fearful that the UN soldiers intended to invade China, another communist nation, Chinese military forces crossed the Chinese-North Korean border and launched an attack against the United Nations troops. By early 1951, the Chinese had driven the United Nations troops to the 38th parallel, roughly the original border between North Korea and South Korea. For the next two years a virtual stalemate existed around the 38th parallel. While both sides launched numerous attacks against the other, neither side succeeded at dislodging its opponent. On July 27, 1953, both sides agreed to a ceasefire, essentially bringing the Korean War to an end. South Korea remained free from communism, and the original borders of these two countries remained essentially unchanged from before the conflict. Most historians claim that the Korean War was a draw, with no clear victor. In essence, that is true. The United States, however, through the United Nations, did succeed in freeing South Korea from communism. At the same time, this victory was costly. Approximately one million South Koreans lost their lives in this conflict. A slightly larger number of North Koreans died, amounting to over eleven percent of this nation's entire population. Almost thirty-four thousand Americans died, and another 100,000 soldiers suffered non-fatal wounds. At the end of the Korean War, more than eight thousand Americans were missing in action. The Korean War had a dramatic impact on Ohioans. In this conflict, 1,777 Ohioans died, and another 4,837 were wounded. Besides losing loved ones, Ohioans also experienced an increasing fear of communism and its potential spread. The Second Red Scare erupted partly due to the Korean War, and Ohioans closely watched their neighbors for communist sympathies. State government agencies, like the Ohio Un-American Activities Committee, came into existence to root out communists. Many Ohioans were accused of communist sympathies. Some of these people truly liked communism, but many other Ohioans were labeled unjustly. Once accused of communist loyalties, many people lost everything, including their jobs and property, helping to enhance the fear gripping Americans, including Ohioans, during this era.